This dress made by Jolis Paons is amazing. 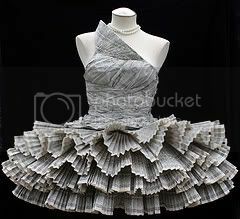 It's completely handmade and entirely made of phone books! Be sure to check out the rest of the pics on her photogallery. Interesting. I wonder what other uses we have for phone books - not sure anyone uses them anymore. Very pretty. I love how the phone numbers make stripes. All the pleating is amazing! And, you're right. I haven't used a phone book for its intended purpose in years. Wow, pretty incredible! Such detail!